A vast conflict, one that has encompassed hundreds of worlds and solar systems, appears to be finally at an end. A conscripted soldier is beginning to consider her life after the war and the family she has left behind. But for Scurand for humanitypeace is not to be. Passengerscombatants from both sides of the warare waking up from hibernation far too soon. Their memories, embedded in bullets, are the only links to a world which is no longer recognizable. And Scur will be reacquainted with her old enemy, but with much higher stakes than just her own life. 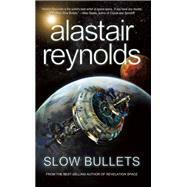 Alastair Reynolds is the bestselling author of twelve novels including the Revelation Space series. He has received the British Science Fiction Award for his novel Chasm City, as well as the Seiun and Sidewise awards, and was shortlisted for the Hugo and Arthur C. Clarke awards. In 2013, he published a Dr. Who tie-in novel, Harvest of Time, with BBC Books. Reynolds has a Ph. D in Astronomy and worked for the European Space Agency before he left to write full time. He currently lives with his wife in Barry, Wales.